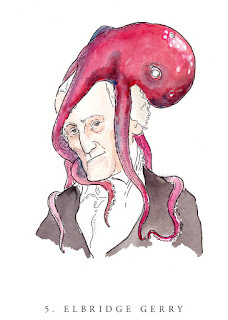 So the book is here VEEPTOPUS: VICE PRESIDENTS WITH OCTOPUSES ON THEIR HEADS, and it is spectacular! It is also SOLD OUT! You can still get a Jon Crow original print of a vice president with an octopus on his (and perhaps one day soon, her) head. And you should. I gave my dad a Spiro Agnew for Father's Day and can't wait to put up my print of my namesake (Aaron Burr - who may have inadverdantly inspired me to get into this business) on my wall. Maybe VPs with cephalopods aren't your thing? 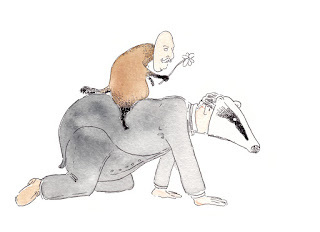 How about Taft with a badger? I have long been a supporter of the entire Veeptopus enterprise. So much so that I contributed a forward to the book. I've written (ok co-authored) three books. So I'm an author. But Forwards are written by august persona, leaders. The opportunity to lend gravitas to this worthy project was an opportunity I could not miss. By placing octopi on the heads of vice presidents and creating Veeptopus, Jonathan Crow has a done a great service to American democracy. The renowned political scientist Samuel Huntington once observed, “Comedy depends on incongruity” and that American humor is born of the incongruity between American ideals and American reality. Prominent but powerless, the veep embodies incongruity. The annals of the vice presidency include many formerly prominent politicians, reduced to historical footnotes by their office. In recent years, the office has changed. In fact, after the Cheney vice presidency scholars and pundits worried about unchecked vice presidential power. An exaggeration perhaps, nonetheless, having spent the better part of a decade studying them I can state that the individuals only a heartbeat away from the presidency are Throttlebottoms no more. So be grateful for Veeptopus in which Jonathan Crow restores some of the incongruity inherent in the vice presidency, providing a much needed antidote to the growing seriousness about our nation’s second highest office. This is something no one, ever, should have to experience. Biden is loquacious and perhaps at times his tongue moved faster than his thoughts (your humble blogger also suffers from this malady.) Because he is less disciplined than most other politicians he has acquired a reputation. As always, The Onion leads the way, depicting Biden as a sort of metal-head/Easy Rider/good-timing guy. But even in more serious papers, he is seen as our national mad uncle. Al Gore… who had developed this annoying, condescending manner of speech that made him sound, when he spoke to us, as though he were addressing a herd of unusually stupid sheep…. George W. Bush… who often sounded as though he had the brain of a sheep…. Here’s the thing: I have actually spent time in social settings with both Al Gore and George W. Bush. I’m not saying I got to know them well, but I will say that Gore seemed more natural in person and Bush seemed smarter. They were nothing like the two over programmed androids I saw debating each other on TV, both of them desperately trying to get all their memorized sound bites in. Considering the amount politicians are required to speak, it is astounding that there aren't far more verbal missteps by politicians. True, Biden appears more prone to these gaffes then others, but this is relative. In his 2008 debate with Palin, Biden handled himself masterfully - demonstrating that he was a seasoned, experienced figure - without appearing to bully Palin. It is a guarantee that every candidate on both tickets will make verbal miscues. Sometimes these mistakes end up shaping a public image as in the unfortunate cases of Sen. Dole in 1976 or Quayle in 1988. Because Biden has a reputation for them, in a sense he is insulated from their fallout. Personally, I've always thought Biden's loquacious honesty worked for him - the apparent lack of artifice being the greatest artifice of all. No one can listen to his heartfelt and honest remarks (drawn from his own deep well of feeling) about loss to TAPS The Military Survivor Network and not be touched. It is a stark reminder that, whatever one thinks of Joe Biden, there is a real person there who loves, hurts, and feels like the rest of us. Dare we consider that all of our politicians - who we primarily see as caricatures of one sort or another (robotic Hillary, dumb Rick Perry etc.) are real people. They - like the rest of us - do the best they can with whatever talents they've been given to wrestle with whatever shadows plague them. Many say profoundly obnoxious things. In some cases they believe them, in others they mispoke. I know I have mispoken many times and said hurtful things. I have believed and articulated things that, in retrospect, are ludicrious. Most of us have. Some of our politicians are deeply cynical people who are little more than animated ambition. (I believe these are fewer than popular opinion would have it, but such people exist. Maybe I'm an idealist - but I find almost everyone I meet has a certain spark of passion, a personality.) But if these ambitious automatons exisit, they are worthy of pity - for no matter how far or high they rise politics does not in the end feed the soul. Being in the grip of whatever compulsions drive them cancels any joy in their achievements.